Freshly into its production brewing arrangement at Full Sail in Hood River, Laurelwood Brewing is releasing Workhorse IPA in 12-packs of bottles. The new packaging will soon appear on shelves at Fred Meyer, Safeway and other retail outlets in Oregon and Washington. The move marks another step in the ongoing evolution of the popular Workhorse, first brewed in 2006. It was released in 22 oz bottles a year later, then won the National IPA Championship in 2009. A highly successful six-pack release followed in 2013. 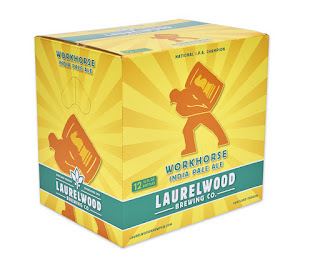 "The 12-pack launch is based largely on the success we've seen with the six-packs," Laurelwood co-founder and owner Mike De Kalb told me via email. "We decided the time was right for 12-packs. It really has nothing to do with moving our production to Hood River. The plan was in motion before we exited our arrangement with the CBA and now we're implementing it." The Workhorse 12-packs will be a year-round offering, available alongside six-packs of Workhorse and Free Range Red. There's also Red Elephant in 12 oz cans, which have limited availability, and seasonal offerings in six-packs, as well as a variety of 22 oz bombers. "We'll roll with this lineup for a while and see how it goes, De Kalb said. "At this point, we don't have any plans for additional 12-packs of bottles or cans in any form. I think our packaged lineup is solid." With competition for shelf space intensifying, now is a perfect time to get Workhorse out there in 12-packs. The move puts a fresh face on the Workhorse brand and promotes the perception that Laurelwood is continuing to evolve and expand options for consumers. Smart business. Laurelwood is a family owned brewery whose beers have won national and international awards. Its handcrafted brews can be found on draft and in bottles and cans throughout Oregon, Washington, Idaho, Alaska, British Columbia, and Japan.